Here is an useful point system to give you an edge in playing the first three cards dealt to you in Razz. Follow the five steps below as it will properly value the strength of your hand given the cards exposed on board, your position in the hand, and the betting action taken by your opponents. It works! Subtract -1 point for each player who has a low card after your potential action in a hand. 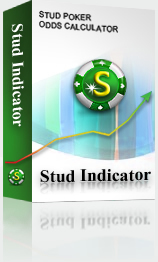 Stud Indicator will display "N/A" if you have a pair or trip in your starting hand. 1 to 4 points If first in the hand, raise. If you follow a call, raise to get heads up. If you follow a raise, call.